Device used in the past on sailing vessels for measuring the rate of speed of the vessel. A quarter circle quadrant of wood, or "chip," fastened to a line, was allowed to run out over the stern, and the amount of line run was measured in time with a half minute sand glass. The sand glass replaced counting the seconds. The line was knotted at specific intervals of 47 feet 3 inches, and each interval was divided into fifths. lines around the globe run north-south, and measure position east or west of a reference line. In 1884 an international conference agreed that the reference line would be the Greenwich Meridian, the longitude line that runs north-south through the observatory in Greenwich, England, outside of London. Maine's longitude ranges from 67° to 71° West longitude. Originally called "routiers" or "rutters", written directions for navigation. for Maine. c.1580-1631. English soldier, sailor, and writer, who became the leader of the Jamestown Colony. Chiefly known in New England for his 1614 voyage in which he mapped much of the coast. He published the story of this voyage as "Description of New England" in 1616. It described the fishing, flora, fauna, inhabitants, and climate, and created the name "New England". This publication did much to promote New England as a destination. made maps of the Maine coast and other parts of New England. Native Americans made maps, and in fact influenced early European maps of North America. But Indians viewed mapping differently from Europeans, who measured distances and fixed exact locations. Native people thought of location in social terms: kinship, cooperating groups, and land use. See American Beginnings for a discussion of maps and Native Americans. Names illustrate differences between Natives and European settlers. Indians named landmarks by use, while Europeans chose names of owners or names reminiscent of their home country. 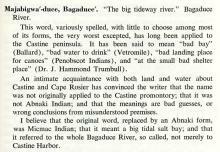 Europeans could write down place names, lending those labels an added communicative power that proved more durable than the Indians’ oral language. Names and fixed boundary locations helped English settlers in Maine take over tribal lands; besides determining boundaries, a map with familiar-sounding English names in print also could help persuade prospective colonists to brave a dangerous journey and the unknown hazards of life in the new world.